Flutes are usually made of metal, but sometimes you will see flutes made of wood. Flutes are some of the highest instruments in the orchestra, and they are very good at playing fast, detailed music. The very highest-pitched instrument in the orchestra is a kind of flute, but it plays a whole octave higher. It's called the piccolo - that's the Italian word for "little"; -- and its sound rings out over the whole orchestra even though it is only a foot long. An orchestra usually has one flute player who plays the piccolo when it is needed. The transverse flute, the flute that is most commonly used in Western music, was known to have existed in China about 900 BCE. The flute reached Europe during the 12th century where it became most used as a military instrument in German speaking areas. This led to its formal name, the German flute. The flute then evolved into a chamber music instrument during the 16th and 17th centuries. These early flutes were often made in one piece with six fingerholes. During the 1600s, however, the flute was redesigned and was built in three sections with joints which connected them together. Gradually, more keys were added to the flute, and it began to replace the recorder in orchestral pieces. By 1800, a four-keyed flute was most common, but during that century, an eight-keyed flute was also developed. Currently, the cylindrical Bohem flute is the most commonly used with thirteen or more tone holes controlled by a system of padded keys. When playing, you will see that we hold the flute up and to the side. We blow across a hole at one end of the flute. If you have ever tried to "play" a glass soda bottle, you've had your first flute lesson! The flute has many keys, and by pressing them with her fingers, we can play different pitches. Piccolos are played in exactly the same way. Flutes and piccolos are easy to carry around. Flutes break down into three parts -- and piccolos into two parts -- that we must put together before she can play. In stories and legends, flutes often have magical properties - like the flute played by "The Pied Piper of Hamelin." In this story, a flutist puts all the kids in town into a trance with his beautiful playing, and leads them around wherever he wants. The spell is only broken when he stops playing. The flute is just over two feet long. Flutes are usually made of metal, and some are even made of gold! Flutes and piccolos are used in orchestras, wind bands, and jazz bands. They have a bright, silvery sound. Other flute family members include alto and bass flutes. These play lower than the standard flute. They are rarely found in the orchestra but are often used in jazz. Orchestras usually have two or more flutes. They sometimes play the same notes as the first violins, making the string sound a little clearer. The flute is often featured as a solo instrument, especially in fast passages. Its highest notes carry over the whole orchestra, and because flutes have so many keys they are very good for playing quick scales and other fast passages. 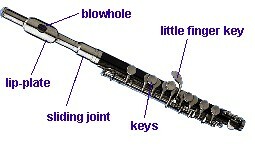 Look at this picture of the flute to see how it is put together. A flutist produces sound by blowing air across the blowhole. The lip-plate provides a rest for the lower lip. The flute has thirteen keys, each covering a hole. The flutist produces different pitches by playing on the keys to cover and uncover the holes. The head joint holds the lip-plate and blowhole. The foot joint forms the flute's opposite end. The body of the flute is the center portion, joining the head and foot joints and containing most of the keys. When a flutist plays, the shape of the mouth or embouchure [say AHM-boo-shoor] is extremely important. By varying the embouchure, the player can adjust the tone of a phrase so that it sounds bright and clear or haunting and mysterious. The head joint can be used to tune the overall pitch of the flute slightly lower or higher. This is most important when a flutist is playing in hot conditions, because the pitch of a metal flute rises quickly as it warms up. To lower the flute's pitch, you can pull out this joint slightly from the body to increase the overall length of the tube. Here's a picture of a piccolo. It's half the length of a flute, and has only two parts instead of three: the head joint and the body (no foot joint).